Nothing is as romantic as adultery. 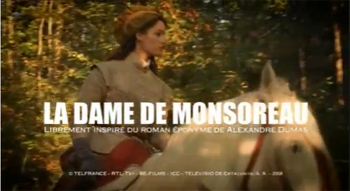 La Dame De Monsoreau (A.K.A. Chicot, The Jester) is the second of The Last Valois series written in 1845 by Alexandre Dumas, père. The action takes place six years after the events depicted on La Reine Margot. It was followed by Les Quarante-Cinq. Henri III is now king of France but sadly he had no heir, except his brother François d'Anjou, who is believed to be the presumptive heir. In his court, his closest friends, les mignons, spend a lot of the royal budget and there are people around him are plotting his fall. The people is displeased with his extravagance, by the relaxation of morals and by the tolerance towards the Huguenots. This just means that the Catholic League is putting its plans together for a new St. Bartholomew. Finally, to round off the scene, Chicot, the court jester, is the only sane man, who not only gives good advice, but is in charge of undo conspiracies while cleverly mocking his king. Amid this chaotic atmosphere, M. Bussy is a gentleman of fierce reputation, beloved by some, feared by the rest, who, in an adventure where he is wounded, meets the woman who gives title to the work. Diane is captive in a house in the outskirts of Paris and her husband is terribly jealous. Bussy becomes one more of the suitors of the lady, though he has the fortune of being the chosen one, Now he just has to find a way to get rid of the husband and to convince the Duke of Anjou to stop chasing her. Piece of cake! Abduction Is Love: It seems that certain hunter fervently believe in this trope. Badass Preacher: Played with: Goreflont is taken by one of them, although he didn't expect to play this role given his love for wine and food. 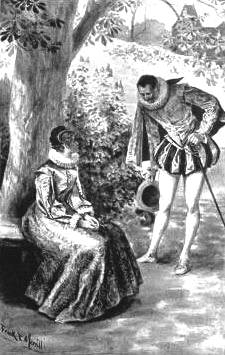 Balcony Escape: Performed by the Duke of Anjou by using the same ladder and the same window as The Mole used in the previous novel. Best Served Cold: combined with A Taste of the Lash. Blindfolded Trip: Diane used this when she needed a surgeon. Body Double: Used to thwart one of The Guise's sibling's plan to make Henri III abdicate the throne. The Champion: M. de Bussy. Chekhov's Gun: a certain silk rope ladder that was last seen in the room of Margot in the previous novel. Church Militant: The Catholic League. Deadpan Snarker: It's a prerequisite for Chicot's job. Damsel in Distress: Diane de Meridor. Duel to the Death: The more the merrier! Especially when the duel involves angevins versus mignons. Faux Death: The mean by which M.de Monsoreau tried to hide Diane from her father and the Duke of Anjou. Although the Duke of Guise's face is marked by an injury and he is definitely a first-rate conspirator. The people love him. M. of Monsoreau, the chief huntsman, is also marked by smallpox. Give Me a Sword: In the most pure epic style, the hero broke his sword and his friend gave him one at risk of his life. Honor Before Reason: could be the only fault of the brave hero. The reason because M. de Meridor didn't fight M. de Monsoreau. Inconvenient Hippocratic Oath: Caught in the dilemma of saving a life or do what could be his friend's happiness, guess what Rémy did. The Jester: Chicot, of course. Lemony Narrator: The scene of the conspiracy of the monastery of St. Genevieve have one who is really funny. Locked Away in a Monastery: The Guises had this destine in mind for Henri III. "I'm not so much to be pitied, after all: she is a beautiful little lass who is two inches taller than me and that would lift me with outstretched arms holding me by the collar of my coat, because she have a large muscle development of the biceps and deltoid. This gives me a reverence which flatters her, and as always I will give it, we do not argue." Mercy Kill: Sarcastically served with the phrase "Deliver him from his sufferings" by the Duke of Anjou. No-Holds-Barred Beatdown: Monsoreau had one on store for his wife's lover. Offered the Crown: The Guises handed the crown of France to the next of the kin, as a cover for their own plans. Passive-Aggressive Kombat: François d'Anjou spend lot of time dealing with this. Siblings in Crime: The Guises are a formidable team when comes to plotting the fall of the Valois. Stand in Portrait: Played with since Busy was not in his sound mind and there was a portrait of Diane in the same room. Succession Crisis: Henri III had no heir, basically by lack of effort, his brother covets the throne, his brother-in-law wants the throne, and the house of Guise would be all happy to take care of France once he was properly dispatched. Traumatic Haircut: part of one of the Guises's plan against Henri III. The princess of Montpensier had her heart set on do it herself with some golden scissors. Unexpected Successor: Henri de Guise fancy that he is one, since his line is as old as Charlemagne's. Window Pain: The same window was crashed by a rock with a message to favor another Balcony Escape, through the same balcony with the silk rope ladder. Your Cheating Heart: Henri de Navarre was spotted in Paris with a new paramour. Adaptational Badass: Diane de Meridor was converted from a Damsel in Distress to a very competent Badass Damsel, fencing included. Chicot died before he can do something to help Henry III. Diane's mother see You Killed My Mother below. The Guises way before their time. The duke of Anjou, and he was spared once, but get it in the end. Even Bad Men Love Their Mamas: Averted, and the duke of Anjou and considered it his first victory. God-Created Canon Foreigner: Joyeuse is a character depicted on Les Quarante-Cinq, but in this adaptation he plays a more prominent role than the whole band of mignons. Standard Female Grab Area: The duchesse de Guise was competent enough in intrigue and murder, until someone took her by the arm, but even there he could find a way out of the predicament. Sweet Polly Oliver: Done often by Diane as a means of escape. You Killed My Mother and my lover is the excuse for make Diane settle accounts with some prince. This page was last edited on 11 August 2014, at 05:39.